Paul McCartney performs at Citizens Bank Park on Tuesday, July 12th, 2016. In times of trouble, you could find yourself in far more unpleasant places than South Philadelphia on a breezy summer evening listening to Paul McCartney sing Beatles songs. Which is what a privileged-to-be-there sold-out Citizens Bank Park crowd got to do Tuesday evening, finding refuge from the 24-hour bad-news cycle with the master of the cheerily melodic pop song just three nights after Billy Joel had filled the Phillies-stadium-turned-senior-citizen-rocker showplace, which will also host Bruce Springsteen later this summer. All told, out of the 38 songs the 74-year-old Macca and his able four-piece band played in a generous and genial nearly three-hour show, an even two dozen were originated by the greatest pop group of all time. That is, if you count "In Spite of All the Danger," the 1958 McCartney-Harrison composition that was the first original song recorded by the pre-Beatles Liverpudlians then known as the Quarrymen. That shoo-bopping product of its early rock-and-roll era was part of a stripped-down skifflelike mini-set in which McCartney strummed an acoustic guitar on the likes of "And I Love Her" and "You Won't See Me." Of course, there was more to the show than the crowd-pleasing Beatles barrage - which began with the crashing opening chord of "A Hard Day's Day Night" and ran straight through to Abbey Road's ultimate "The End," and included songs originally sung by John Lennon ("Being for the Benefit of Mr. Kite!") and George Harrison (a charming "Something," on ukulele). There were love songs written for his late wife, Linda - "Maybe I'm Amazed," McCartney's most glorious post-Beatles track, from his '70s solo years - and the not-bad piano ballad "My Valentine," for his current spouse, Nancy Shevell. Hard-core Wings fans were rewarded with the electronic ephemera of "Temporary Secretary." And in case you thought the lefthanded bass player was just a septuagenarian relic of the classic rock era, he sang a spirited version of "Four Five Seconds," his 2015 collaboration with Kanye West and Rihanna, complete with sing-along lyrics projected on a video screen, which made the unlikely promise that the cute, shaggy-haired Beatle was just "four five seconds from wildin'." 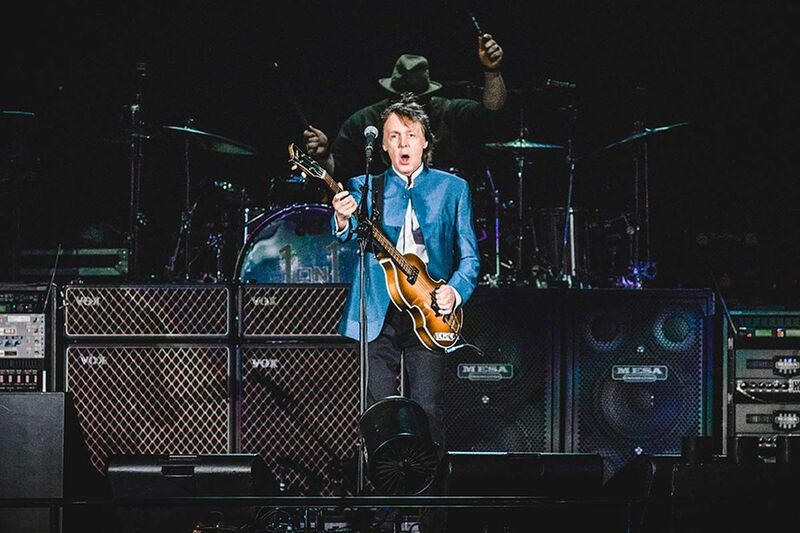 McCartney played the Wells Fargo Center in South Philly (as well as the Firefly festival in Delaware) just last summer, and his new One on One tour, which is scheduled to be at Hersheypark Stadium this coming Tuesday, has undergone only minor tweaking since then. He was a bit hoarse at various points throughout the evening, as he struggled to ring out as he sang of the balalaikas on "Back in the U.S.S.R." His stage patter is getting a bit stale too: That story about a Russian defense minister telling him that he learned English by listening to "Love Me Do" is a charmer, but it's been getting old over the years. But really, those are quibbles. McCartney may not be your favorite member of the Fab Four, but with all respect to the lovable Ringo Starr, he's the best one we've got left. It's especially clear in this year in which so many musical greats have been lost, that we're lucky to still have him around, chasing our troubles away.